For generations healthcare has been episodic – someone gets sick or breaks a bone, they see a doctor, and then they might not see another one until the next time they get sick or injured. Now, as emerging technologies such as artificial intelligence open up new possibilities for the healthcare industry in the Fourth Industrial Revolution, policymakers and practitioners are developing new ways to deliver continuous healthcare for better outcomes. Consumers already expect access to healthcare providers to be as smart and easy as online banking, retrieving boarding passes and making restaurant reservations, according to Kaiser Permanente CEO Bernard J Tyson. Nearly three-quarters of Americans with health insurance (72%), for example, say it’s important that their health insurance provider uses modern communication tools, such as instant message and two-way video. Innovative healthcare organizations such as Kaiser Permanente are listening. The company is not only looking at how they harness technology now, to provide patients with better access to care, but how it can be used in the future to diagnose and treat chronic disease early, so people have a better chance of leading longer and healthier lives. Achieving the dream of personalized healthcare for everyone won’t be without challenges. Not only will healthcare providers have to develop and adopt new technology, they will also have to collect, aggregate and share the vast amounts of patient data, and organize it into a usable form to train the AI systems to make intelligent diagnoses, advice and predictions. They will also have to address the very real privacy concerns raised by high-profile cases such as Google's acquisition of DeepMind Health, which may see the tech giant get access to 1.6 million National Health Service patients’ data in the UK. Already, digital assistants such as Amazon’s Alexa and Apple’s Siri are using AI to handle routine tasks, from making restaurant reservations to scheduling meetings and returning phone calls. The digital assistants of the future will be full-time healthcare companions, able to monitor a patient’s condition, transmit results to healthcare providers, and arrange virtual and face-to-face appointments. They will help manage the frequency and dosage of medication, and provide reliable medical advice around the clock. They will remind doctors of patients’ details, ranging from previous illnesses to past drug reactions. And they will assist older people to access the care they need as they age, including hospice care, and help to mitigate the fear and loneliness many elderly people feel. Collecting the genetic information needed for precision medicine is already becoming easier and less expensive. It’s now possible to have your entire genome sequenced for less than $1,000 (and access it via a mobile phone app). In 2007, the cost was $350,000. In addition to improving people’s health outcomes, being able to quickly identify effective treatments could also help reduce the cost of healthcare by reducing the number of treatments and procedures doctors prescribe. This will become increasingly crucial as the world’s older population continues to grow. Globally, countries including the US, China, and Japan, as well as pharmaceutical companies, are investing billions on researching precision medicine. The great power of harnessing AI is that access to these innovations won’t just be limited to the wealthy few. More of the world’s population will benefit from these advances. In Africa, cancer is now the No 1 cause of death. The Rwandan government is working with the World Economic Forum to increase the country’s diagnostic capacity for detecting cancer. As examples such as Massachusetts General Hospital and Harvard Medical School’s breast cancer screening trial prove, AI can be used to accurately assess scans, make recommendations for treatment, and reduce unnecessary surgeries caused by false positives. With the right kind of policy and infrastructure in place, the potential benefits of AI-driven medicine would be enormous for Rwanda. 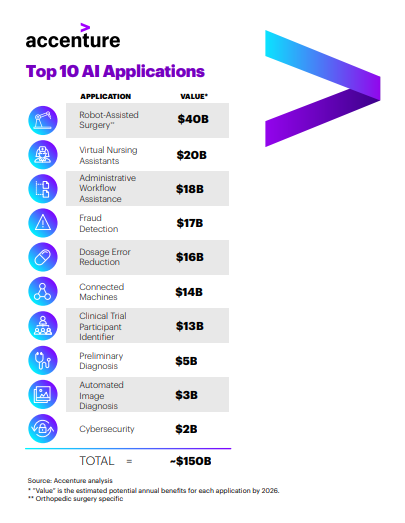 AI is already contributing to reducing deaths due to medical errors. After heart disease and cancer, medical errors are the third-leading cause of death. Take prescription drug errors. In the US, around 7,000 people die each year from being given the wrong drug, or the wrong dosage of the correct drug. To help solve the problem, Bainbridge Health has designed a system that uses AI to take the possibility of human error out of the process, ensuring that hospital patients get the right drug at the right dosage. The system tracks the entire process, step-by-step, from the prescription being written to the correct dosage being given to the patient. Health insurance company Humana is using AI to augment its human customer service. The system can send customer service agents real-time messages about how to improve their interaction with callers. It’s also able to identify those conversations that seem likely to escalate and alert a supervisor so that they’re ready to take the call, if necessary. This means the caller isn’t put on hold, improving the customer experience and helping to resolve issues faster. These are both great examples of the kinds of problems that can be solved with AI. We’re going to be seeing more and more innovations like these. AI has the potential to revolutionize healthcare, but if we want to make sure that this leads to better healthcare outcomes for everyone, then we need to do three things. Firstly, governments and other organizations need to develop protocols for safely and sustainably building the emerging personal data economy. Only by allowing people to manage and trade their own data will we calm fears about data security and misuse, and ensure the good flow of high-quality data that healthcare providers will require to build smarter AI systems. Second, we need to maintain a strong ethical mindset when considering the moral implications of using technology to make decisions about people’s health and well-being. This includes being transparent about the algorithms employed and the data used to feed them, so that patients understand why a decision was made. And finally, we need to dream big. Diseases like polio and smallpox have been virtually eradicated in many parts of the world already, so why can’t we do the same with other diseases? Imagine a world without sickle cell anemia, without cancer! When thinking about the future of healthcare, the potential is immense. Now let’s make it happen.